Grab a stack of freshly designed shopping baskets sized especially for little hands. Set of 4 in New Sprouts colors (orange, green, purple, blue). 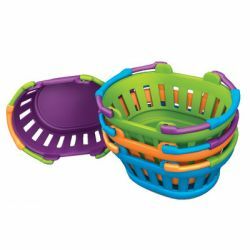 Oval baskets measure approximately 7"L x 4"H. Ages 2 and up.